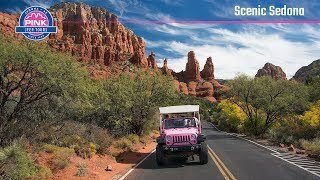 If you’re seeking a Pink® Jeep® experience without our usual off-road antics, the Scenic Sedona Tour is right for you. This mild, all-pavement excursion showcases the area’s beautiful red rocks and landmarks during a relaxing ride through the town and its surrounding scenery. Start your trip at our Pink® Jeep® Tours Plaza. After a quick overview, you’ll hop aboard an open air Pink® Jeep® Wrangler, designed to give you an immersive experience with unobstructed views. This custom-built vehicle will be piloted by your own Certified Interpretive Guide who will take you on a two-hour tour of the area. Once you hit the road, think of this as a chance to choose your own adventure. Your guide will work with the group to tailor the tour to your interests. Your final route can include famous area landmarks like the Chapel of the Holy Cross, a drive to the overlook atop Oak Creek Canyon, a stop at the top of Airport Mesa or views of Cathedral Rock from Red Rock Loop Road. Throughout the tour, your guide will point out rock formations, delve into local legends, offer insight into the red rock’s geology and provide insider tips on where to eat and what to do. When planning a trip to Sedona, be sure to add this tour to your to-do list. It’s the ideal introduction to an area with endless ways to explore—and a great taste of what you can expect from Pink® Jeep® Tours and our many adventures. The tour was just what I was lookin for! Stephen was wonderful—engaging, informative and funny. Highly recommend!! It was amazing! I am 4 months pregnant and Scenic Sedona was the only tour my husband and I could do together. We were worried we would see the same things we saw on other Sedona tours but Phil went out of his way to make sure we had a great time and saw some amazing parts of town. We will definitely be back for other tours in the future. Sonia was amazing! Super friendly, very informative and a great tour guide!!! Gene was very engaging, knowledgeable and fun. Catered the tour route to his guests needs and abilities. Learned a lot of history, flora and local lore. It was great. Adam took us all over Sedona. Explained Everything we needed to know. We really liked him. I didnt know a thing about the area so it was fun to learn some things. We heard people talk about the Snoopy mountain and we couldn't figure out how it got that name until Mike said its Snoopy laying on his back.